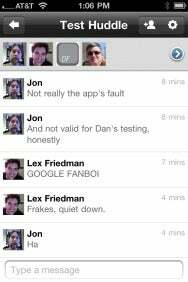 The Google+ iOS client offers quick access to most of the service's features. When Google+ launched late last month, Google released an Android app for the service and promised that an iOS app would join it soon; on Tuesday, Google delivered with an official native client for Apple’s mobile platform. At least, for some of Apple’s mobile platform. While the Google+ iOS app is designed for iPhones running iOS 4.0 or later, there’s currently no support for either the iPad or, bizarrely, the iPod touch. Upon launching Google+ for the first time, you’ll be prompted to log in to your account, after which you have access to your Stream, Photos, your Profile, and your Circles, along with a new mobile-specific feature called Huddle. One feature that’s not present is Google’s Hangout video chat, but given that it relies on a Flash plugin, that’s not exactly a surprise. Most of the features offer roughly the same functionality as the Google+ site: You can scroll through your stream, comment and +1 your friends’ posts, and even browse through updates of people near you (which you can also do via the website, but is a little handier on the phone). And, of course, you can check into nearby locations and write your own posts, complete with pictures snapped from your camera and geolocation tags. Huddle is a quick way to send messages to a group of Google+ users. 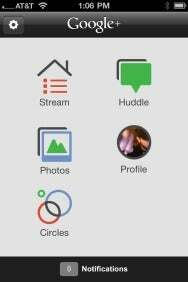 The highlight of the app, though, is a new Google+ feature previously available only on Android phones: Huddle. Huddle is Google’s attempt to simplify group text messaging; it’s similar, in some ways, to Apple’s forthcoming iMessage service or RIM’s BlackBerry Messenger service, though it has the advantage of now being cross-platform. You can send messages to an individual, to multiple users, or even to a whole Circle. Users who don’t have a smartphone client will get an e-mail that prompts them to download one. Huddle even sends delivery and read receipts, so you can tell that your recipient has received and read your message. Once you’ve initiated a Huddle you can change the name, so it’s easy to see keep multiple Huddles distinct, or mute it so you don’t get notifications of new messages; that’s good, since there doesn’t seem to be anything to prevent you from being messaged by nearly anybody on Google+. (At least new Huddles created with you appear to be muted by default.) And, of course, you can always leave a Huddle if you don’t want to be included any more. Google’s UI could use some polish, and there are a handful of usability issues—for example, when adding people to a Huddle, you have to wade through all the people who follow you as well as Google+’s integration with your iOS address book. The rest of the features are spartan, but functional, as with many of Google’s other iOS apps. In one strange development, an update to the Google+ app was released shortly after the app itself debuted. The new version added better support for blocking unwanted messages in Huddle, better support for attaching photos to a post, as well as bug fixes and performance improvements. However, at least two Macworld staffers noted problems logging into the service with the update that required force-quitting and relaunching the app, suggesting that Google’s traditional “beta” label may apply here as well. Whether Google+ will catch on in a world with Facebook and Twitter remains an open question, but with clients on the two hottest smartphone platforms around, Google’s certainly trying to cover all the bases.